Countdown: three months til I join the ranks of the US born, Argentine expats. There is so much to do and so much information online that it can be hard to sort through and make sense of it all! Fortunately, there are some adventurous and generous souls who have forged this path before me and are making their experiences known all over the internet. From popular social networking sites and news sources to tweets and blog posts, there is no shortage of first-hand BA knowledge in cyberspace! My current favorite source of social, political, cultural everything is The Argentina Independent. The site is up-to-date, written in English, and posts something about nearly anything I want to look into that is happening in Latin America. The Weekly News Roundups, also accessible through their Facebook page every Friday, provide quick summaries of the week’s events with links to further internet self education. 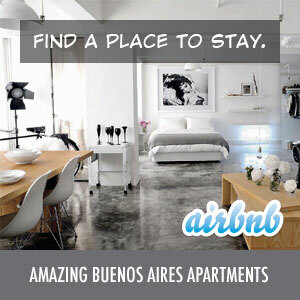 I’ve also been following Buenos Aires Life (@buenosaireslife) and Agenda Cultural (@bacultural) on Twitter. The former tweets everything from serious political issues to celebrity sightings, while the later focuses on where to eat, drink, and dance any night of the week. All important things! Tweets are in Spanish, which forces me to practice. No cheating! BA Expat Hub is exactly what it sounds like; a place for non-natives to be in contact, share experiences, and get information. It appears to still be working on its content and user base, but is a valuable resource nonetheless. I like that it includes polls (Question: “What is your poison of choice for a night out?” Current winning answer: “Fernet y Cola!”) and new bar and restaurant reviews. I was particularly siked to learn that Happy Hour is typically from 7pm to 12am in BA! Nothing like a late night special. I recently submitted my first forum post asking the community for a head’s up on available apartments for October. We’ll see what kind of response I get! And of course, Discover Buenos Aires has been my go-to blog for figuring out the practical matters of moving to Argentina. The author, Dave, is a NYC transplant who offers his experience and valuable advice regarding how to ride the city’s notoriously chaotic public transport, how to get an iPhone to work on the cheap in BA, and the best and worst deals for travel, banking, eating, and more. So much of my research for this trip has been based on Dave’s wise words! I am writing about my experiences in planning my adventure from the States to Argentina on my own blog as well at Buenos Aires or Bust! I’m still figuring it out, but I hope that all the tips I learn and decisions I make in this move, with the help of the BA online community, can be used by others hoping to do the same. Feel free to comment with advice, comments, and criticism! All productive input is welcome!